Our BT contract end soon and I dare say I will be ringing up to haggle. However given the pricing of Vodafone and Now TV for example I don't imagine BT will get anywhere those prices. 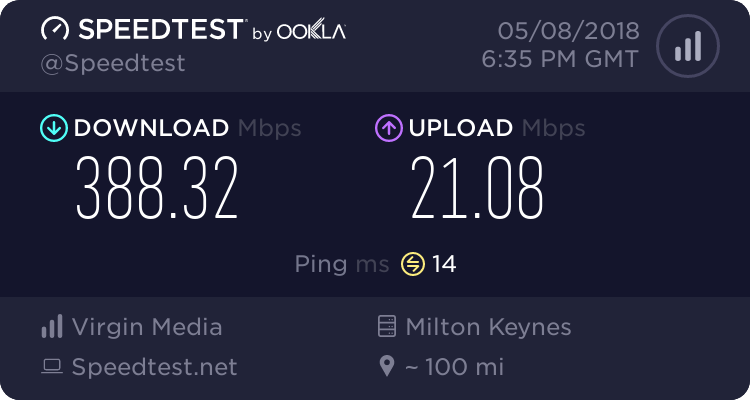 I am erring towards Vodafone as they allow use of own equipment; my trusty unlocked HG612 achieves the best sync of those I have tried whereas Now TV supply a modem/router (seems to be a SKY Hub) and don't allow other modems. I would not wish to lose any of my present 19mbs due to modem issues. Another option is to go for Virgin Media, but there is no easy route from pavement to house and I don't fancy cable tied to walls and fences. Is Vodafone using that old second hand network called CW which TalkTalk used years ago. Switching to Vodafone has proven (so far) to be a good choice for me. Real (SamKnows) download speed has gone from <7 Mbps on ADSL to >37Mbps on 40/10 VDSL, and I am syncing at 39999/9999 kbps. Attainable is reported as a little above 125/31. And I am paying less for FTTC VDSL than I was for ADSL. But I know I am blessed with a very good line: I am on a Huawei cabinet installed under the BDUK scheme with both Vectoring and G.INP, which is approx. 200m by underground duct from the house, and half of that distance is on our property with no possible crosstalkers. With my limited requirements and the availability of such a good line, price was the determining factor, and I have not regretted it. I hope your experience is as good as mine! Think TT started their own (CPW/CW) network as OPAL but within a few months had bought out AOL UK's network for LLU.... and then a couple of years later they bought out Tiscali's network. C&W is a bit more complex, their retail arm (Bulldog) was sold to Pipex and for a while they concentrated purely on wholesale/backhaul services. Later Pipex was then also sold to Tiscali, but Pipex/Murphx/Daisy have quite stong links with C&W in the past and C&W mopped up what remained of Pipex's Access Network. During the period surrounding 2006-2008 there were so many buyouts, mergers and re-aquistitions it was hard to keep track.. especially when retail arms may go to one buyer and wholesale to another. Tiscali soaked up a lot of the retail/consumer SPs whilst business or wholesale may remain untouched. Pipex was a heck of a tangled web and I still don't fully know what went where other than consumer ended up at Tiscali and yet somehow reverse takeover meant parts of their business ended up as what is now Daisy and other bits at C&W. Not for FTTC - It's now in their T&C's which you are supposed to read and agree to before you sign up. access Sky Broadband we cannot guarantee that ADSL Sky Broadband will work with these. I'm not sure as I don't use Sky... but don't you either need a MER modem/router or run in bridge mode? bridge mode modems will work fine with fttc. You need option 61 ability on a router to make it work. There are very few that will work off the shelf. Asus needs merlin to get ipv4 up. I use Opnsense and pfsense before that which work fine thanks to mods done by others... Netgear don't work either unless they have ddwrt loaded like the r7000, stock firmware doesn't have the option to add a user name which you need when the wan port is setup for sky's requirements. I just keep my sr102 incase of faults etc..
yes its allowed kitz. --> edit--> I agree with kitz now, reread it and yeah thats clear sky specifically consider these devices not allowed. They dont support it, but thats very different to not allowing it. I know people can confuse the two things but they not the same. Actually locking down a modem, look at Virgin Media, they have customers stuck on PUMA devices that cause constant latency problems, but they are locked to those devices via MAC enforcement and would be breaching t&c if they swapped the devices. Also the sky hub even allows you to use an openreach modem on their setup wizard (any compatible modem, but the image shows a hg612). It has a WAN input connection for this purpose. MER has absolutely no affect on the modem. For the router, it has an affect and yes is a limited set of routers/firewalls that can technically support it, such as PFSense and OPNSense. To the OP check my sig to see hardware I am using on sky right now. Thanks for the input folks. The thing is on other forums they state that Sky's T and C's prohibit use of anything but their own equipment to connect to the internet. Obviously this does not mean it is not technically possible which clearly it is. I reread the quote kitz kindly posted. The last 2 lines to be fair indicates its a breach, that does seem to have been reworded actually. So I now change my opinion in relation to kitz's post, I think it wasnt always like this, but I am not 100% sure either. However sky are definitely aware there is people using other devices on their network and to this date have decided to not block it and have even made it easier by making technical changes to accommodate these devices. If your supplied device for now tv is a sky hub, at the very least tho that does support plugging in a 3rd party modem on its setup wizard which would mean your hg612 should work in an out of box config. However my sky hub does have old firmware, I cannot rule out a firmware change altering the setup wizard to prevent this. So I suppose it comes down to if you want to take a punt that sky will not decide to enforce their hardware on their network at a technical level (I think they wont). But just be aware if you ever contact tech support you may need to plugin their equipment if they want to follow their support scripts. When I reported my last line fault I didnt have to do this, they ran tests on my line without the sky hub hassle. So I now change my opinion in relation to kitz's post, I think it wasnt always like this, but I am not 100% sure either. I'm not certain either but I think they changed it within the past couple of years to specifically mention FTTC. It wasn't like that when they had the Pro option (ex BE) and if I were to take a stab at when they reworded it, it would most likely be when they dropped the Pro account. bridge mode modems will work fine with fttc. You need option 61 ability on a router to make it work. There are very few that will work off the shelf. Asus needs merlin to get ipv4 up. I use Opnsense and pfsense before that which work fine thanks to mods done by others... Netgear don't work either unless they have ddwrt loaded like the r7000, stock firmware doesn't have the option to add a user name which you need when the wan port is setup for sky's requirements. Thanks for the clarification. I was concerned that people would think they could just go buy any modem/router and expect it to work out of the box. Well sky specifically cannot block modems as thats openreach managing that part of the connection, so it would come down to if they do things like MAC whitelisting to enforce the router and then decide to not allowed modems to be connected to those devices. Merlin's Asuswrt does work with sky, the ipv6 side of it is dodgy but stable on ipv4. So any asus router that will work on Merlin Asuswrt should be fine as a router, as well as OPNSense and PFSsense compatible devices. DDWRT does have option 61 support as well. I think there may be a couple of TP-link modems that are also MER capable. Only reason I know is I supplied most of the auto config info to TP-link combined modem routers and my contact said they were going to look at MER options to enable their modem/routers to work on Sky out of the box.